THEY were one of the original boy bands, and for over five decades have been entertaining sold-out crowds throughout the world. 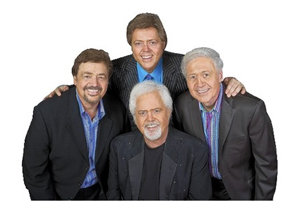 Back in the 1970s, the very mention of the name, The Osmonds, would be enough to send teenage girls into a swooning faint. Nowadays their fans are still as loyal, though somewhat less hysterical, and 2012 will see the brothers, minus Donny, taking them on their Up Close and Personal Final Tour. The tour, which comes to St George’s Hall in Bradford on Tuesday April 3, will feature their many unforgettable hits from classics such as One Bad Apple, Down By the Lazy River, Let Me In and Love Me For A Reason, to Crazy Horses and Long Haired Lover from Liverpool. Tickets are £27.50-£29.50, call the box office on 01274 432000 or at www.bradford-theatres.co.uk.